Sometimes pheochromocytoma is part of another condition called multiple endocrine neoplasia syndrome (MEN). People with MEN often have other cancers and other problems involving hormones. Doctors use lab tests and imaging tests to diagnose it. Surgery is the most common treatment. Other options include radiation therapy, chemotherapy, and targeted therapy. Targeted therapy uses substances that attack cancer cells without harming normal cells. Article: Colorimetric detection of normetanephrine, a pheochromocytoma biomarker, using bifunctionalised gold nanoparticles. 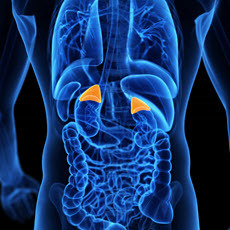 Article: Primary malignant tumors of the adrenal glands.